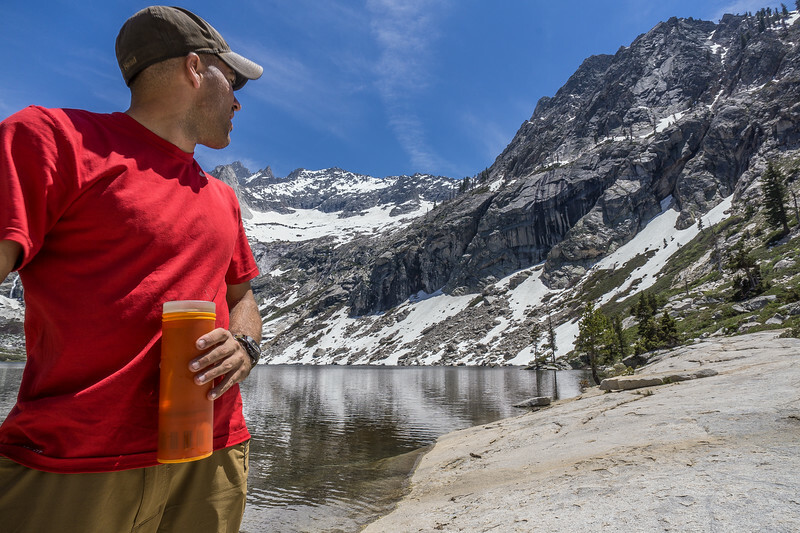 The Grayl Ultralight intrigued me and I was excited that Grayl was gracious enough to give me a free purifier to test 6 days on the High Sierra Trail to Mt Whitney. Before I got out on the trail, I did some in-home tests and it worked great. It was simple, sturdy and filtered water quickly and easily. My first impressions of the Grayl Ultralight were superb! But then I took it out on the trail and filtered water from creeks, rivers, and Mt Lakes. Now all of these water sources on this trip were not very silty and the water was very clear. Unlike my Grand Canyon trip where I was filtering water from the silty Colorado River. Basically all the water sources I hit on the High Sierra Trail should not have been too difficult for any water filter to cut through. I used the Grayl Ultralight for myself and a friend, as our only water purification means for 6 days, 5 nights. The Grayl started off great, it worked just like it worked on the tap water in my apartment that I tested it on. On the second day, we filtered some water from a stream and had no issues topping off a couple Nalgenes. On the 3rd day, we were pretty low on water and had to fill both our camelbaks (3 liters each) and water bottles. This is where things started to go downhill. We stopped at Hamilton Lakes, a beautiful stop on the way to the Kaweah Gap. I was excited to really test out my Grayl and see what it could do, so I dipped it into Hamilton Lake. So let us take a look at what topping off all my water sources in one go with the Grayl Ultralight. -One Press of the Grayl Ultralight = 16oz of clean water. That's not including my water bottles, my buddies Camelbak etc. It started out fine, the Grayl worked great, but each press became just a tad bit harder than the previous one. Each press took just a little bit more effort to press. The more and more water I pressed and purified, the more I found myself concentrating my pressing form. You can see in the above picture I am pretty much just using my arms and shoulders, this is fairly early in the trip. The more and more I used it the more, I would find myself focusing more and more on putting all my body weight over Grayl. Toward the end of our water resupply at Hamilton Lake, my hands were sore as hell. The rim of the Grayl is hard and if you use it multiple times back to back your hands will be in some pain. The Hamilton Lakes stop, was not completely horrible for water purification but my hands ached at the end of it, and I was glad to be done filtering water for the day. It just wasn’t exactly an enjoyable experience. But I had clean great tasting water! 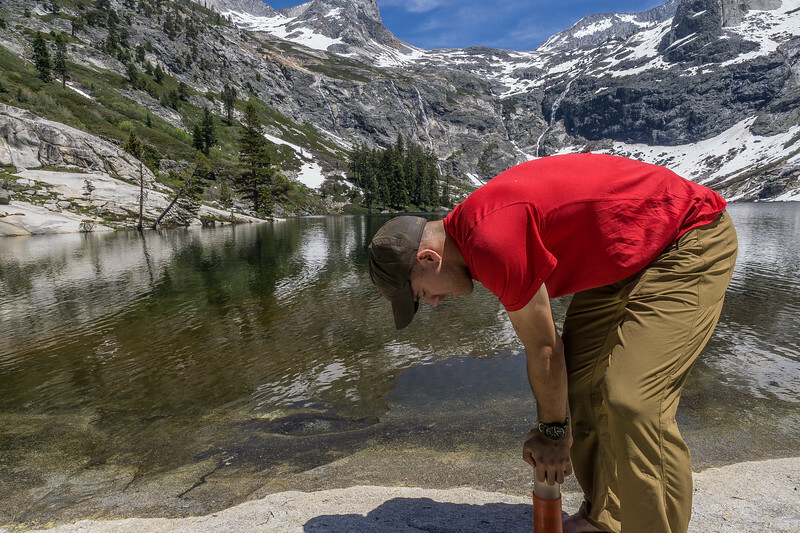 The next day we camped high in Kaweah Gap, and it wasn’t until the next day that we filtered water again. The more and more we hiked on the more I slowly began to hate filtering water. It became harder and harder to press down, and my hands hurt more and more. 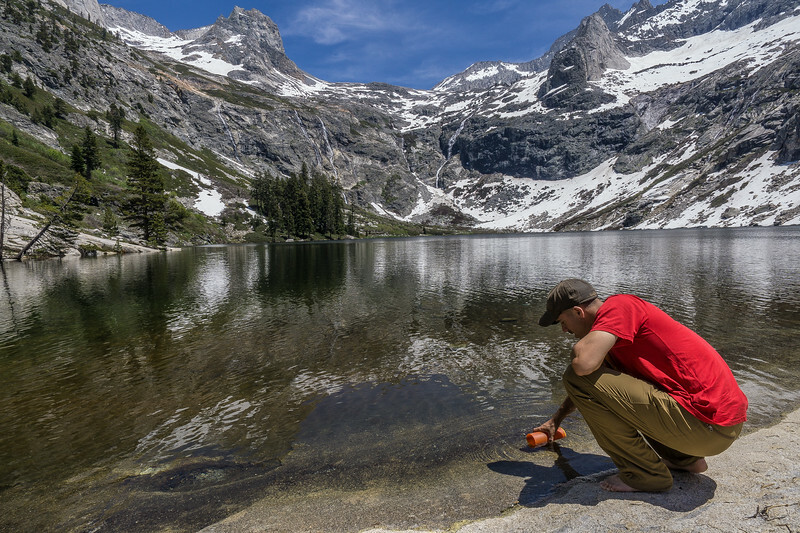 By day 3 I started to wear gloves while filtering water my water with the Grayl Ultralight. The gloves helped ease some of the pain on my hands, but still, it became tougher and tougher to purify our water. I began not topping off my water sources, because I just hated filtering water at this point. I then resorted to extreme measures to save my hands, I resorted to my trusty Ka-bar! First off, I do not recommend what I am about to describe, but its what I decided to do, in order to continue to filter water more easily. I put the blade of my Ka-bar across the top of the Grayl and put one hands palm across the top of the blade and the other on the handle of the Ka-bar. I then pushed and twisted, and it seemed to go down a little bit easier. The filter on the Grayl Ultralight seemed to get clogged extremely quickly. It made filtering water a chore, something I loathed doing every day on the trip. The bottom line is that the Grayl was the least enjoyable piece of gear that I brought on the trip. I wanted in the worst way to enjoy the Gray, I really did give it a chance. I loved its design, simplicity, and strength. But the amount of physical effort it took to get clean water, was just not worth the squeeze. Its a lot more expensive but I am now looking into the MSR Guardian for a future trip, as it is self-cleaning. Thanks for the write-up, Mike. I'm always very cautious when planning on where I'm going to grab water along the way. I'd love a guardian but $350 is pretty steep. Currently I use a Sawyer Squeeze and I'm pretty happy with it, but there's definitely room for improvement. jrowejr I have not caved and purchased the Guardian yet... but I did buy the MSR trail shot. I have only brought it on one trip so far ( This one ) so I need more time to put it through its paces before I say yay or ney, but I like it so far. I hear everyone has a Sawyer Squeeze these days. I really should buy one. I think I would love to drip bag it too, which would make chilling around camp at the end of a long hike much more enjoyable. jrowejr The Sawyer Squeeze is only a filter not a purifier though like the Grayl or Guardian? MikeJones Oh nice the trail shot seems great--I've heard that the two systems are pretty similar. I only pulled the trigger on a Sawyer because it was on sale for less than $20 at the time. Ive worked in water purification for about 10 years so I geek out over it. jrowejr Ive worked in water purification for about 10 years so I geek out over it. Nice! I love water fiilters/purifiers. 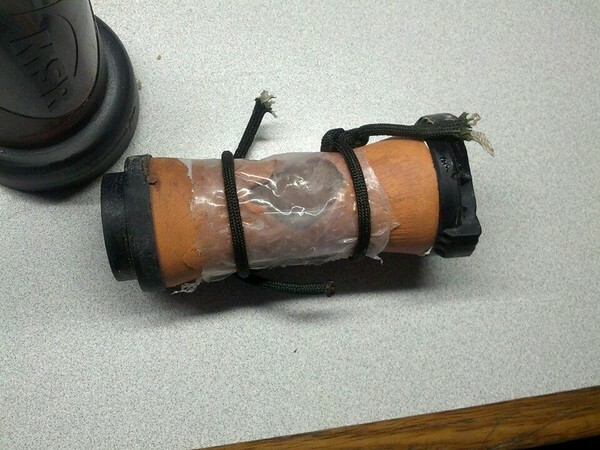 I had a ceramic filter from MSR that I cracked in the Grand Canyon (Need to add that trip report to this site). The colorado river was so silty we had a ton of cleaning to do, which is what geets me excited about the Guardian despite its price. The self cleaning seems awesome! MikeJones Oh no! I'd hate to imagine being trapped without a way to purify water..Hopefully you had a backup or were able to figure it out. I'll save the suspense for the write-up; looking forward to it. But we ended up scooping water out of the river and letting it sit at night so the sediment would sink to the botom, than poured through a shirt and boiled. It slowed us down a lot, but we got out alive. CaliHiker unless Sawyer came out with a new filter recently than you are correct the Sawyer is just a filter and the grayl can purify.